Discussion in 'Orchid Species' started by seidenfaden, Jun 18, 2018. Corybas hispidus, commonly known as the bristly helmet orchid, is a species of orchid endemic to eastern Australia. It is distinguished from other helmet orchids by its autumn to winter flowering period, (Spring and Summer here in the UK) and by its tube-shaped; 20-30mm long labellum, which has a bristly-hairy, creamy-white centre and is deeply notched along its top edge. 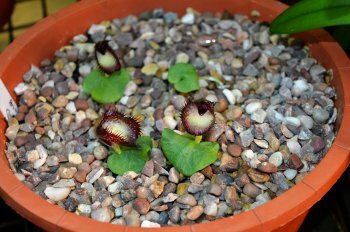 Corybas hispidus is a terrestrial, perennial, deciduous, herb with an underground tuber. It has a single dark green leaf which is more or less circular in shape, 15–35 mm long and wide and silvery-green or reddish on the lower surface. slippersnpitchers, Leo in N.E. Illinois, John Klinger and 2 others like this. Very interesting. I assume this is a temperate growing species, not tropical? Very nice, can you share how you grow them? I absolutely love Corybas. What an amazing plant! I agree with naoki: how do you grow them? I received four small rounded tuberous corms from a friend in January this year and planted them on 11th Feb. For the compost mix I used ordinary soil mixed with some leaf debris with soil from beneath a tree (for mycorrhizal fungi) and also some very fine gravel all mixed together. Finally some slightly larger gravel to place on the top after the corms germinate. The pot stands in a 1" deep saucer to keep the plants damp but not wet The flowers appeared on Wed 13th of this month. But they seem to be going over now. I'm growing them warm with bright light. DPfarr, weeand and naoki like this. I've re-potted the corms again today with the same mix as previous. Was there significant growth in that time? I don't understand what your question refers to. My previous communication was June 19 - 2018. With regards to a request for info on culture on June 18th-2018.